Germ will be making its big-screen debut in the movie adaptation of All the Bright Places, the New York Times bestselling novel where Germ originated. In the book, main character Violet Markey is reeling after the recent death of her sister. She meets a boy called Finch and, along the way, creates Germ Magazine. Elle Fanning (Maleficent) will be starring as Violet. (!!) The novel debuted this January, but the story was optioned by Hollywood producers Paula Mazur and Mitchell Kaplan months before its publication. 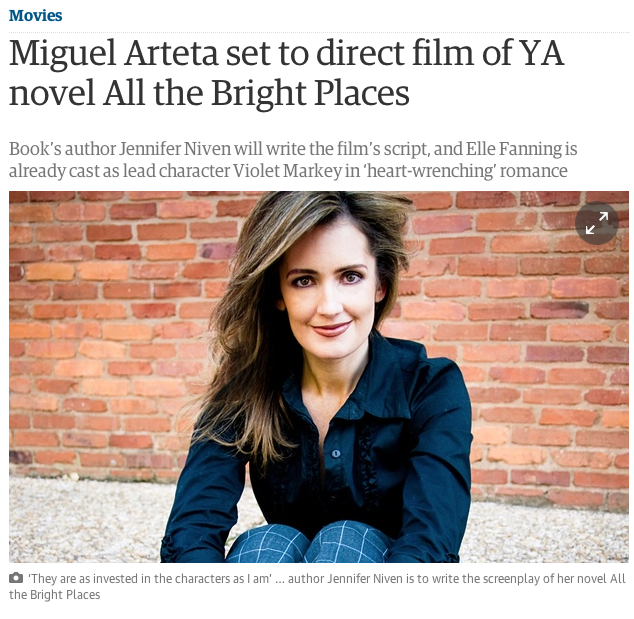 Miguel Arteta is to direct Elle Fanning in the movie adaptation of Jennifer Niven’s YA novel All the Bright Places.Niven will write the movie’s script, with Demarest Media on board to finance and produce the picture alongside Mazur/Kaplan, who brought the package to them. Production is slated to begin in Spring 2016. Fanning will play the the role of Violet in the love story about a girl who learns to live from a boy who intends to die. Arteta most recently directed Alexander and the Terrible, Horrible, No Good, Very Bad Day, and earlier lensed Cedar Rapids and Youth in Revolt.”All the Bright Places is a very personal story for me. Mazur/Kaplan, Miguel, and Demarest Media have given the book and me the most wonderfully supportive, creative home, and they are as invested in Finch and Violet as I am,” Niven said Monday in a statement. Leif Lillehaugen will oversee the project for Demarest and Ally Israelson for Mazur/Kaplan. Arteta’s deal was negotiated by WME, Management 360 and Lichter, Grossman, Nichols, Adler & Feldman. Fanning’s deal was hammered out by WME, Echo Lake Management and Hansen Jacobson, and Niven’s by RWSG and Levine Greenberg Rostan Literary. All the Bright Places’s move to the screen has a director on board. Miguel Arteta (Cedar Rapids, Youth in Revolt) was announced Monday as the helmer of the project, starring Elle Fanning as Violet. 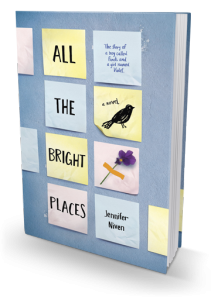 All the Bright Places traces the relationship between two completely different teenagers, Violet and Finch, that begins when each contemplate suicide. Written by Jennifer Niven, the heart-wrenching book currently sits at No. 5 on the New York Times best-seller list. Arteta will direct a script written by Niven. Production is scheduled to begin in spring 2016. Visit the movie’s IMDb page!